Heat oven to 350°F. Brush 1 teaspoon of the oil on 15x12-inch cookie sheet. Unroll pizza crust dough on cookie sheet into 12x9-inch rectangle; brush with 2 teaspoons oil. Bake 10 minutes. Meanwhile, in 12-inch skillet, heat remaining 1 tablespoon oil over medium heat. Add onion and garlic; cook about 5 minutes, stirring occasionally, until onion is tender. Stir in undrained beans, cumin, coriander and pepper; cook 1 minute. Stir in rice and butter. Stir in chiles. Remove from heat; set aside. Using slotted spoon, spread thin layer of salsa over partially baked crust. Layer with 1/2 cup of the cheese and the bean mixture. 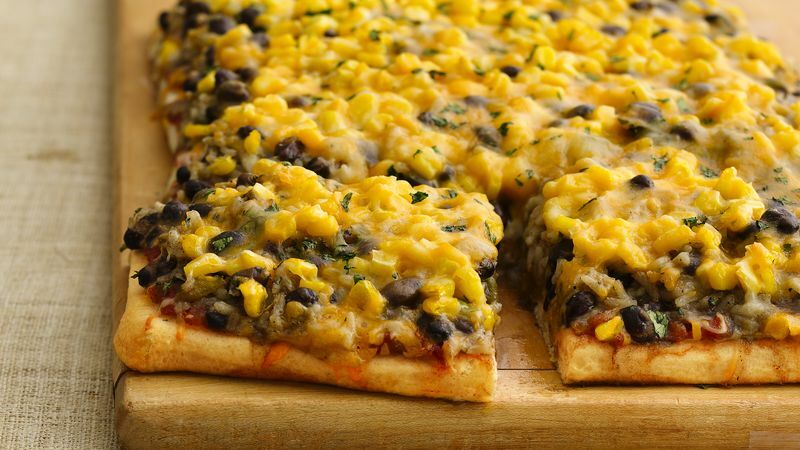 Sprinkle with 1 tablespoon of the cilantro, the corn and remaining 1 1/2 cups cheese. Bake 20 to 30 minutes longer or until edges of crust are golden brown and cheese is melted. Garnish with remaining 1 tablespoon cilantro.